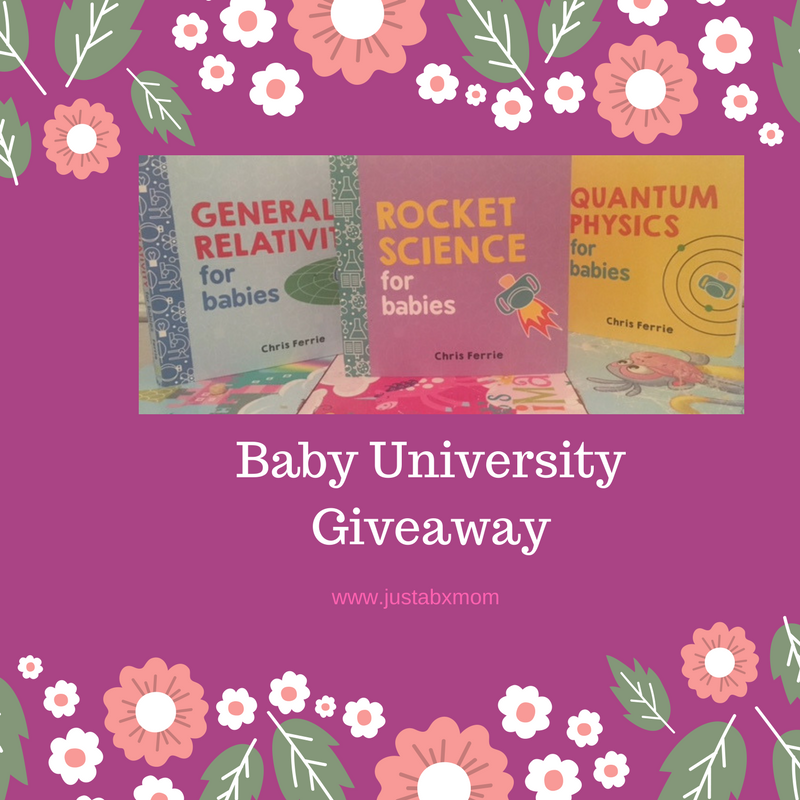 Baby University Giveaway – It Actually is Rocket Science! Did I tell you about the time I read the article that said the reason so many of our littles have trouble with math is because we don’t foster a love and understanding of math the way we do of reading. We’re not reciting times tables the way we recite the alphabet. The same could be said about sciences. How many of us have really spent time explaining quantum physics to our babies? How many of us actually understand quantum physics?? I’m challenging us to change the narrative. Let us start valuing full education for our littles way before they start school. Recently I was blessed with the opportunity to check out a new series Baby University by Chris Ferrie. Baby University is a series of board books that tackle complex subjects in a very simple way. Forget science for dummies, this is science for babies! Disclaimer: I received these books for review purposes. As always opinions are honest and solely those of mine and JustaBXgirl’s. This post contains affiliate links. If you make a purchase through the link you will not be charged extra but I may receive a commission. Chris Ferrie is a scientist and father of four. He believes it is never to early to introduce these concepts to children and I have to agree. The first four books of the series recently came out and are available on Amazon. I have to admit I was a little worried about reading these with JustaBXgirl because I don’t know much on the subjects. That’s the best thing about them. You don’t have to know anything. They are written very simply and break down quantum physics, rocket science, general relativity and Newton’s laws of motion. Apparently, Newtonian Physics is JustaBXgirl’s favorite because when I grabbed the series from her shelf to take pictures for this post it was nowhere to be found. Now to some that might mean it’s not an important book that was a) hidden not to be read, b) lost somewhere or c) given away. Not in JustaBXgirl’s world. In her world that means a) we took the book with us at some point recently and it’s in whatever bag I used that day, b) she was reading it to herself and put it away somewhere “safe” or c) she hid it so she doesn’t have to share with her cousins. I can admit that reading the books on the train have gotten us some inquisitive looks. A few people even asked us about the books when they saw us out and about reading one. If babies had coffee tables these would be the books they placed on them to start conversations with company. Maybe if these existed when I was a child I wouldn’t be so intimidated by the sciences. Raising a beautiful, brown girl I am all about removing intimidation from her world anyway I can. How cool is this?! When you get to the end of the book you get an award! Can I put this on my resume??? And if reading science books can help her be less fearful of the subject matter than this parenting thing might be easier that it looks! For real though, your child might not be ready to work for NASA after reading Rocket Science For Babies but they will understand how to change air flow and how a rocket ship works! Don’t worry, you can pretend that you’re only interested in these books for your littles. We can pretend that I’m the only parent that needs more than a refresher on these topics. Either way I hope you too will spread the idea that babies can learn and comprehend these topics and many more from the start! Ooh, but wait there’s more. You have the chance to win a set for your little (or for yourself, it’ll be our secret)!!! No purchase necessary to enter or win. A purchase does not improve your chances of winning. VOID WHERE PROHIBITED BY LAW. Open to legal residents of USA who are 18 years or older. Giveaway begins and ends at (5/16 – 5/22/17). Enter the Giveaway during the Promotion Period online by submitting the entry form. Winner will be selected by Random.org and be notified by email. Winner has 48 hours to respond before a new winner is selected. 1 winner will receive finished copies (one of each) of General Relativity, Newtonian Physics, Rocket Science, and Quantum Physics (approximate retail value or “ARV”: $70.00 US). By providing your information in this form, you are providing your information to Sourcebooks & JustaBXmom. Sourcebooks & JustaBXmom does not share or sell information and will use any information only for the purpose of this giveaway. I love all science. In high school I was particularly fond of Social Science. Bio was my favorite. Disection though was not! My favorite science was biology. I liked Biology the best! We got to do drawings, artwork and dissections!! I was terrible in Science! I guess biology was my favorite. I want my grandchildren to love Science. Thanks!